“NOCTURNE – THE ROMANTIC LIFE OF FRÉDÉRIC CHOPIN”. This program of words and music scripted from Chopin’s letters and writings, adapted by Lucy Parham (Piano) and narrated by actors Dame Harriet Walter and Guy Paul will take place on October 2 and 3. Both programmes will the same. NOCTURNE had its premiere in London in 2010 on the 200th. anniversary of Chopin’s birth. 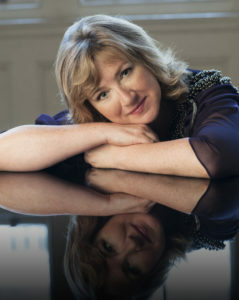 Lucy Parham is acknowledged as one of Britain’s finest pianists. She first came to public notice as the Piano Winner of the 1984 BBC Young Musician of the Year. Since her concerto debut at the Royal Festival Hall at the age of 16, Lucy has played throughout the UK as a concerto soloist with most of Britain’s major orchestras. Lucy toured the USA with the BBC Concert Orchestra on its 50th anniversary. Lucy’s love of Schumann’s music inspired the original concept of the words and music evening. Other than Nocturne Lucy has created portraits in words and music about Schumann, Debussy and Rachmaninoff. Dame Harriet Walter is a well-known British actress of stage and screen. She has played most of the major female Shakespearean roles with the Royal Shakespeare Company (RSC). These include Cleopatra opposite Patrick Stewart and Lady Macbeth opposite Sir Anthony Sher. Notable TV appearances include Downton Abbey (Lady Shakespeare) and The Crown (Clemmie Churchill). Her film appearances include Star Wars: The Force Awakens (“co-star” Chewbacca). Christopher Lee of Dracula fame is her uncle. Harriet is also the author of 4 books. Harriet was awarded an Honorary Doctorate from Birmingham University and CBE in 2000 and she was made a Dame in 2011. She married American actor Guy Paul in 2011. Guy Paul was born in Milwaukee in 1949. He is known for his work on Fantastic Beasts and Where to find Them, a 2016 fantasy film. It was a prequel to the Harry Potter Series. Other films he starred in include The Fifth Estate and Hyde Park on Hudson. Paul and Harriet have appeared together in the SkyAtlantic series Patrick Melrose starring Benedict Cumberbatch. This entry was posted on Monday, September 17th, 2018 at 10:29 pm	and is filed under Press Releases. You can follow any responses to this entry through the RSS 2.0 feed. Both comments and pings are currently closed.